NEW YORK—A tall, slender woman, with an inviting dignity about her, and the most radiant smile on earth, hugged children as they trickled into her fashion-forward boutique by Madison Square Park, Noir et Blanc, at around 10:30 on a sunny morning. “You can give love and there will always be more. It’s a barrel that never gets empty,” Deborah Koenigsberger said beaming. She told the children to gather at The Thrifty HoG next door so that they could get ready for their summer camp activity that day. They were going to have a fun day at the beach on Coney Island. On other days they have visited museums, universities like Yale, or cities like Philadelphia where they learned about the Liberty Bell; they write essays and get extra tutoring after school. 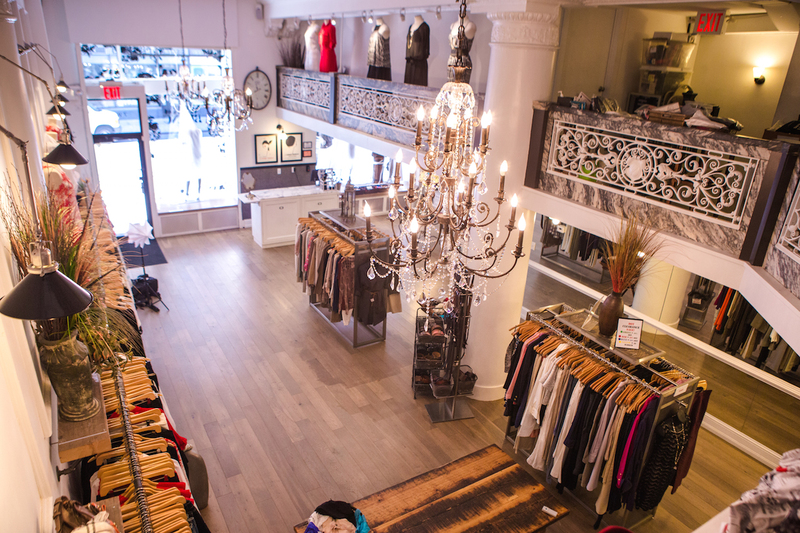 A board member of the Manhattan Chamber of Commerce, Koenigsberger owns the French-inspired boutique, Noir et Blanc, and the stylishly curated resale boutique next door, The Thrifty HoG. 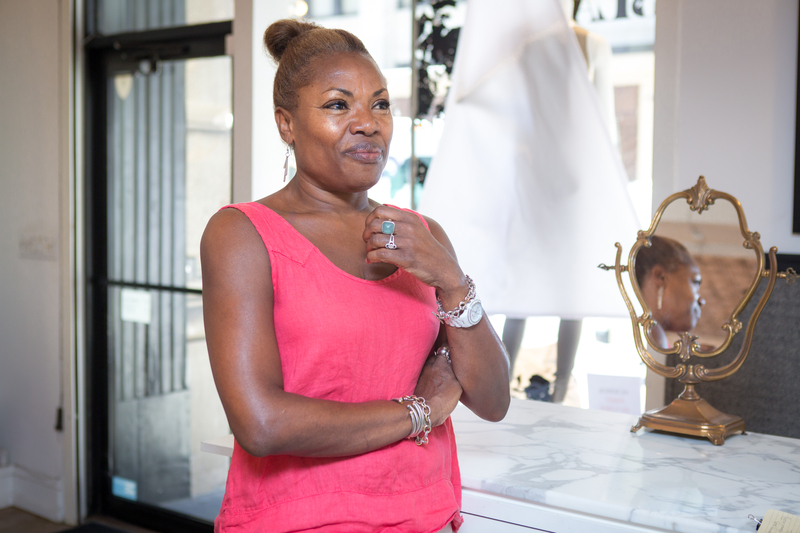 Her stores double as the administrative office for the nonprofit she founded 20 years ago, Hearts of Gold (HoG), which has been helping homeless children and mothers become self-sufficient. 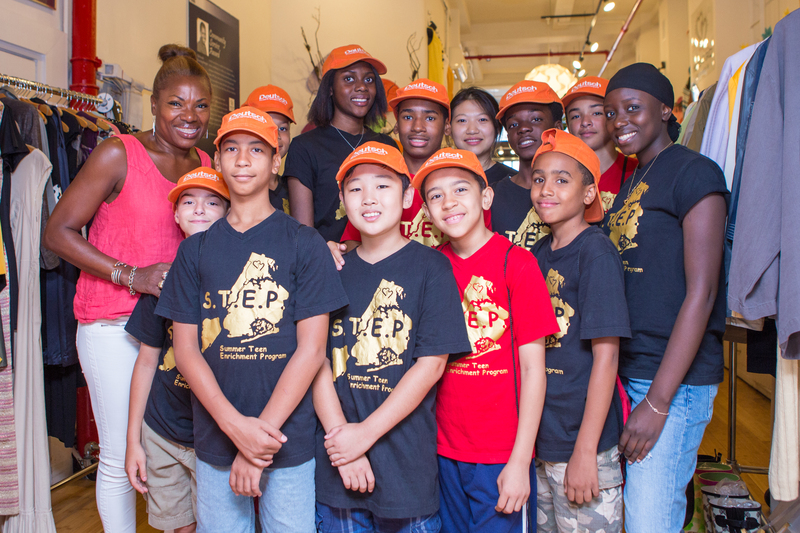 The summer camp, STEP (summer team enrichment program), for preteens and teens is just one of several HoG programs. 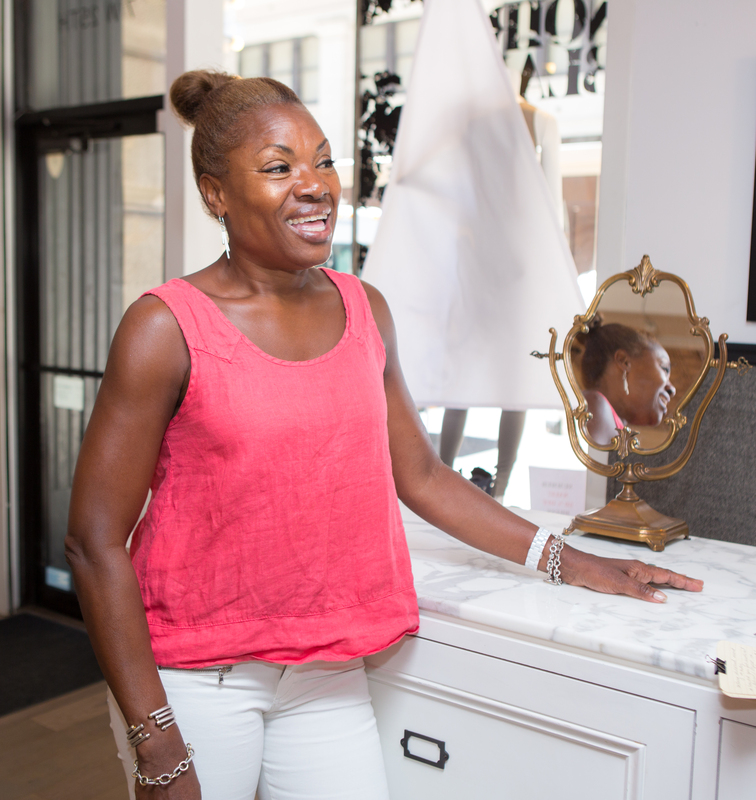 While her customers can afford to buy Prada, they keep coming back to Noir et Blanc for the unique pieces she carries—made in Europe, Canada, and the United States. As a former model and a stylist, she’s well known for advising her high-profile customers and friends on fashion choices. “It’s like a one stop shop, so I get a lot of referrals,” Koenigsberger said. Her Noir et Blanc customers and celebrity friends will often donate clothes to the The Thrifty HoG, and all the proceeds go to her nonprofit. Koenigsberger also provides on-the-job training to the mothers employed at The Thrifty HoG. I always say this, and it’s so true, I get so much more out of this than I put in, I do! A 2-year-old lets go of her mother’s hand, runs over to Koenigsberger, and gives her a hug. “I always say this, and it’s so true, I get so much more out of this than I put in, I do!” Koenigsberger said. “I get so much joy out of that little girl running down the block to give me a hug, who doesn’t want that?” she added. Definitely a woman of action, Koenigsberger’s confidence and generosity is palpable. She’s always moving, because sitting blocks her energy she said. She doesn’t waste time worrying or mulling over what could be done. She just does what she knows she can make possible. “To me the word ‘enough’ is a big deal. We all need to understand is where our enough point is and then say, ‘Okay, now I can share and give because I have more than enough,'” she said. The chance meeting of a homeless woman sleeping in a cardboard box, a Stevie Wonder song, and the encouragement of a makeup artist friend all coalesced to give Koenigsberger the idea to found Hearts of Gold. She lived on Madison Avenue between 32nd and 33rd streets when she was studying romance languages and German at NYU. She would walk through Madison Park when it used to be trashy, “like a heroin den,” she said. She came across a young woman who slept in a cardboard box with her daughter. “I was initially leery, because you never know … but I slowly approached her one day,” she said. The woman did not talk very much but told Koenigsberger that she had decided to live in the park because people would steal her things, would harass her, and beat her up in the shelter. Koenigsberger built up a kind of relationship with the woman, bringing food for her and her child. One day the woman wasn’t there anymore. “I lost her, never saw her again, never saw her again,” Koenigsberger repeated. “But even though she physically left, she never left me. I pray for them and I hope that they are doing well wherever they are,” Koenigsberger said. 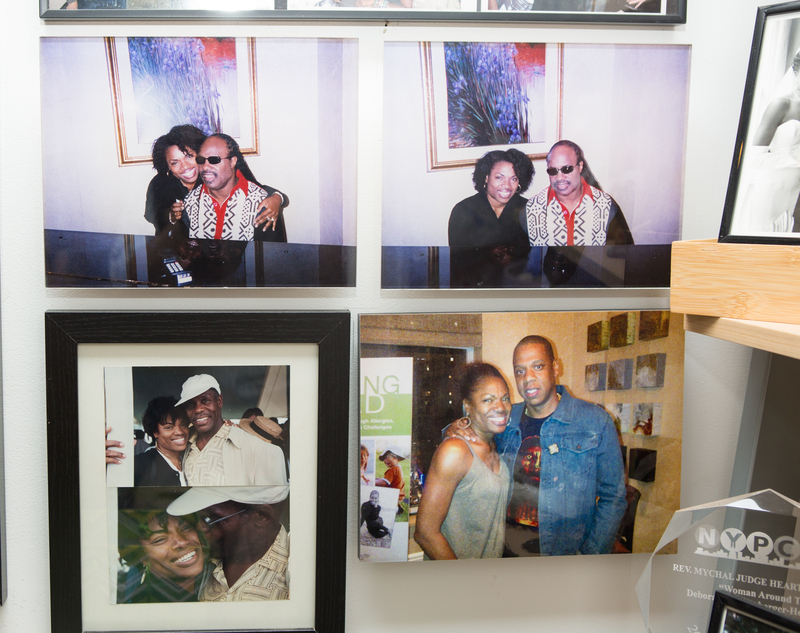 That experience along with the song about homelessness, “Take the Time Out” (Album: Conversation Peace, 1995) by Stevie Wonder—who’s Koenigsberger’s idol, “this man is just beyond,” she said smiling—inspired her to affect change. Three years before that song came out, during a summer vacation in Florida, Koenigsberger met Bobbi Brown when Brown was a makeup artist just about to launch her cosmetics company. Back in New York Brown encouraged Koenigsberger to give a talk at a homeless shelter on 28th Street to mothers about how to dress at job interviews, while she talked about makeup. So both of them created an immersion program that was a huge hit. I was born with the fire of my mother … I would always say what I thought. Brown would later be Koenigsberger’s first supporter at the first Hearts of Gold fundraiser. That year Koenigsberger then approached a Red Cross shelter offering to create a Christmas party with gifts for the children. She told her husband and two sons that the family would have a small Christmas, but would provide a big Christmas for 136 children who really needed Christmas. “Every child got a red shopping bag with toys and books and clothes and stuffed animals, it was great and it was really like Christmas, but something also happened,” she said. One of the little girls went to show her mom what she got and her mother just said, “So,” with indifference. “I remember being so shocked and heartbroken, but it was because I didn’t understand,” Koenigsberger said. She didn’t understand because she and her husband always wanted to give everything to their two sons. When Easter came around she approached her friends in the fashion industry, including Ivana Trump for whom she did wardrobe consulting. She provided Easter Bunny baskets with gifts for the children and the mothers. Brown provided a cosmetic product and Trump, who was making gazillions of dollars on HSN (Home Shopping Network) provided jewelry. That’s how she decided she was going to make Hearts of Gold about moms and kids. But Koenigsberger’s initial spark for founding Hearts of Gold and her strength of character goes further back to her childhood experiences growing up in Jamaica and her strong-willed mother who passed away 20 years ago. “I just don’t remember a time when my mom complained about stuff. We had enough, we had certainly enough love from my mom and dad,” Koenigsberger said. Her mother moved to New York City to establish her career as an assistant nurse at NYU, and her father would soon follow a couple of years later to work as an electrical engineer at AT&T and establish a new home for the family. In the meantime, Koenigsberger was put under the care of her paternal grandparents and would spend time with her high-class aunt and uncle in Jamaica. Her aunt treated her like a second-class citizen. She recalled feeling like Cinderella while her cousins were treated like royalty in comparison. “I was born with the fire of my mother, so I’ve always had a mouth, I would always say what I thought. In Jamaica you can’t talk like that, it’s not allowed, it’s not polite,” she recalled. So to keep her in her so-called place, her aunt would say things to her but fortunately at the tender age of 10 Koenigsberger did not realize how hurtful those things were at the time. When you have somebody to disappoint, you try harder. “She basically said to me, you will be nothing and you will have a string of kids, you won’t even know who the fathers are. When these things were said to me I didn’t process them as anything important, except that it made me really angry,” Koenigsberger recalled. Koenigsberger is the kind of person who becomes more determined to prove such assumptions wrong in the short and long-term. In September she will celebrate her 25th wedding anniversary with her very supportive and loving husband, Thilo. She raised two very philanthropic minded sons. Stephan, the younger, is a nationally ranked swimmer studying geology at Middlebury College, and Florian, the older one, graduated from Yale and now works at Google. She attributes her aunt’s insensitivity to the practice of class prejudice handed down from the former British imperialism in Jamaica. “It was the culture. People looked down on other people. Here in this country, you have racism, there [in Jamaica] you have social class, and you are raised thinking that if you come from this side of the fence then you are that, and if you come from that side then you are that, that’s just how it was,” she said, pointing in opposite directions. Koenigsberger knows what it feels like to be put in a box, and to overcome other people’s assumptions or limitations they impose on her. Instead of bringing her down, it fires up her empathy and generosity even more. “Somebody needs to be telling these kids and mothers that they can. It’s amazing what will happen if you don’t drink the Kool-Aid. So I didn’t drink the Kool-Aid and here I am, and I’m going to make sure that they don’t drink the Kool-Aid,” she said. The Hearts of Gold children regard her as an aunt, the mothers as a sister, a strong and compassionate pillar of support. 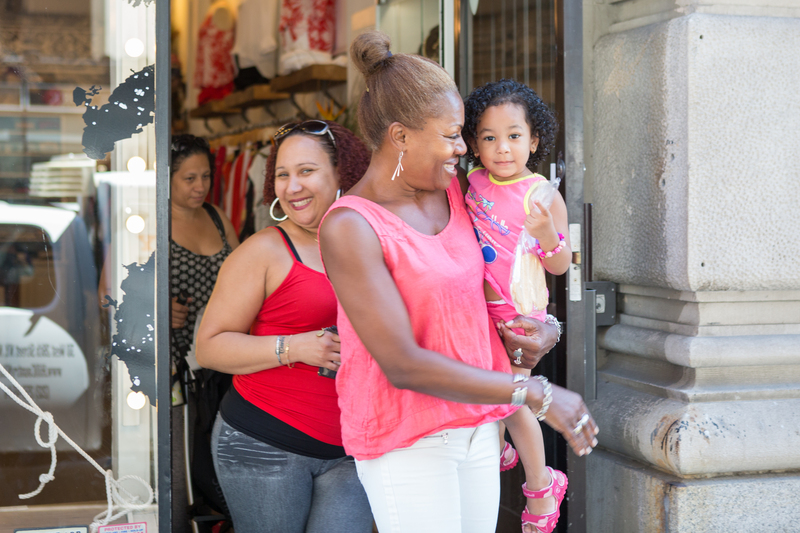 “They [homeless mothers] need love and they need somebody to disappoint,” said Koenigsberger. “When you have somebody to disappoint, you try harder,” she said. She will warn the mothers not to disappoint her, because she’s putting out a lot to help them get out of the poverty rut. “If everybody knows that somebody’s got their back, it’s a beautiful thing,” she said. Koenigsberger has gathered over $9 million in financial support for homeless mothers and their children. At her first fundraiser in 1996 she gathered $3,000. Last year she raised $800,000 with her board. The next Hearts of Gold fundraising gala will be on Nov. 5 at Nasdaq in Times Square. “It’s grown, and I have really amazing friends,” she said calling the biggest benefactors, Michael and Cheryl Barrett, who have supported HoG from the very beginning, and Nick and Shelley Schorsch, “Amazingly huge hearted people.” In addition to Brown and Trump, she has also received support from Kirsten Dunst, Susan Sarandon, Edie Falco, Marcia Gay Harden, Hoda Kotb, Laura Linney, Emme, Soledad O’Brien, Tamara Tunie, Vanessa L. Williams, and Stevie Wonder. French people say ‘Il faut du tout pour faire un monde’ meaning, you need a little bit everything to make a world, Koenigsberger said with a fluid French accent. “And everybody has to be doing different things, because if everybody stopped what they were doing today and only focused on charity work there would be nothing to give, so we need a Schorsch to be super successful, so he can give, we need the guy who delivers my mail, we need a little bit of everything,” Koenigsberger said, smiling as the mailman comes into Noir et Blanc to deliver certified mail. Koenigsberger signed and said, “There you go,” with a radiant smile. Founder and Artistic Director of the New York Concerti Sinfonietta, Dr. Julie Jordan talks about upcoming triple-header concerto performances May 3–5, 2015, showcasing protégé soloists. Lori Klinger, co-founder of Rosie’s Theater Kids, talks about how the non-profit arts education organization teaches essential skills and life lessons to underprivileged public school children. Pianist, actor, designer, and reality show producer, Konstantin Soukhovetski inspires young pianists to expand their talents at Pianofest in the Hamptons.